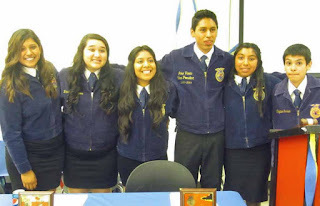 The Westminster High Future Farmers of America (FFA) Chapter celebrated its 40th anniversary on May 31 with a banquet. The banquet was a celebration of this year's successes as well as past decades' achievements. Many FFA students received honors and awards in recognition of the hard work they had done in different areas of the agriculture industry. Westminster FFA Chapter awards banquet. 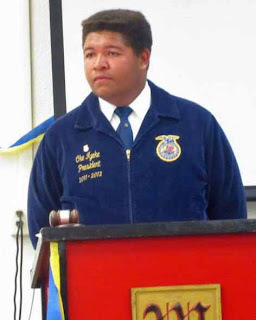 The California FFA Association was founded in 1928 and serves more than 70,000 California high school students. Agromin is a proud sponsor of the Westminster High program. Jennifer Cerda ( Reporter), Vanessa Angeles ( Vice-President), Ingrid Hernandez ( Secretary), Jose Varela ( President), Cynthia Herrera ( Treasurer) and Ricardo Cevantes ( Sentinel). Congratulations to students and FFA teacher advisors Dave Eusantos and Brian Kim for a successful 2012-2013 school year!